Creative solutions for an uneven number of maids and men. Q. My fiance and I have hit a road block in planning our wedding party. He has many close guy friends wants at least seven groomsmen (preferably more). I only have about four very close girls and one or two girls beyond that that I feel somewhat close to. I would love to have my four girls be my bridesmaids and that's it. He wants me to find at least three more and is not into the idea of an uneven number of bridemaids and groomsmen. What should we do? A. The choosing of bridal party participants is certainly one of the more compromising subjects that a bride and groom have to decide on when planning their wedding. There are so many feelings that become involved when making these decisions, not only with the couple but also the friends and family you include or may not include. Stick to the principal that it is your day and that you should be making decisions together that make you happy and that resembles you as a couple. Ensure you both talk through all of your options and then determine the importance of this detail for your wedding day. You want to make sure that you are surrounded by people you love, people who support you and your new life together and people you will want to see in pictures when you look back decades from now. I strongly suggest you don’t place people in your wedding just to fill a gap; this is not fair to anyone involved and may create unwanted drama for you during the planning of and possibly on the day of your wedding. Walk through the financial aspects of this decision with your fiancé. Adding another three bridesmaids could very easily tack on another $500+ to your bridal party budget based on what you are providing for them. Reminder: when it comes to bridesmaids there are many more costs than groomsman: dress, shoes, jewelry, hair/makeup, flowers and more. Ushers – have the remaining guys he would like to include as ushers in the wedding, this makes for a very important role with in the wedding and it distinguishes them as close friends of his. 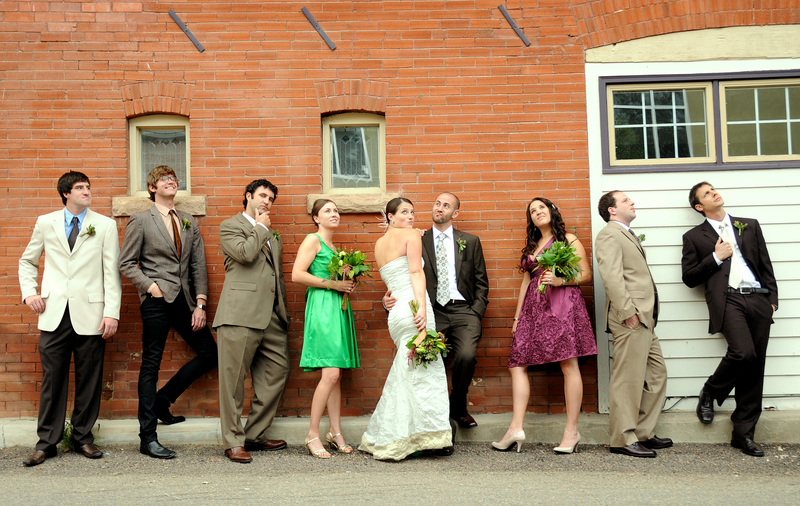 Your photographer will be able to space out your bridal party to ensure they won’t look lopsided. There are so many possibilities to make this ceremony so unique to your situation and your guests will love the variety of a different ceremony. Do not be afraid to entertain any of these ideas as your ceremony will be beautiful and wonderful no matter how many friends and family are standing up with you. This will be the first of many compromises with not only wedding planning but also in your new life together just make sure each other is heard and respected and work through it together. Congratulations on your upcoming wedding, remember to relax and enjoy! Christina Anderson, owner of Christina Marie Events, is trained and certified through the Association of Bridal Consultants. Contact her at 952.233.1813 or info@cmaries.com. Local brides dish the details on the latest bridesmaid dress trends. How Much is Too Much to Ask Your Bridesmaids to Spend on a Dress? Q. I found beautiful bridesmaids dresses, but I’m worried they are too expensive. What’s a reasonable amount to ask my bridesmaids to spend? Always a Bridesmaid. . .